Signs, street art, and sculptures: oh my! Chalk it up to the artistic pursuit of just that: chalk! 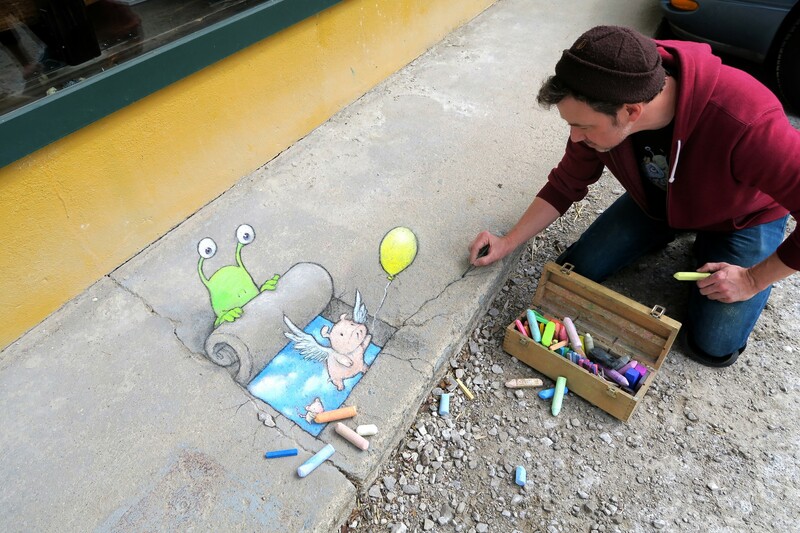 I can’t wait to see David Zinn’s feature of Greenville and Artisphere through chalk drawings. He uses the authenticity and vibe of a city to embrace the outside, to create art in unexpected places, and to always remind you to (occasionally) watch where you’re walking. His crowning achievement for Artisphere this year will be to show his own version of “Mice on Main.” Definitely one of our favorite Greenville traditions, so we can’t wait to see what he shows us about how to experience living local. Have you been to the new Aloft Hotel in downtown Greenville? If not, check out the wall on the left when you walk into the lobby. Matt Gutierrez, the mastermind behind the chalk murals, will debut at Artisphere this year! We are excited to welcome him to the show, and he will be the official festival chalk signage artist. What does a chalk signage artist do? Great question! Gutierrez will lead us through the festival with hand-drawn signs in visible public spaces. What a novel way to leave a trail of public art and help curate your Artisphere experience. 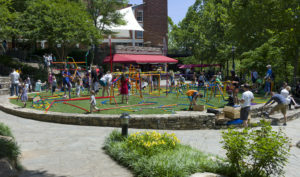 Sculpting the way through downtown, The Donaldson Career Center will reprise British sculptor Julian Wild’s communal sculpture and involve visitors in making a large sculpture using PVC pipe and joints in Falls Park. An interactive community experience, “Making the Connection Communal Sculpture Project” is about the process of creating art, letting everyone have a voice, and showing us that we all have the capacity to inspire and explore. Of course, this is only a taste of the amazing quantity and quality of artwork on display for the festival weekend. Keep following us for more updates as the festival draws closer: only a few more weeks!